One of this year's most highly anticipated novel releases has to be Star Wars: Ahsoka. After Ahsoka's shocking return, and subsequent exit, in season two of Star Wars Rebels, fans have been clamoring to learn more about the beloved Togruta Jedi-turned-Rebel. More recently we heard the even more exciting news that the voice of Ahsoka herself, Ashley Eckstein, would be providing the narration for novel's audiobook adaptation. Earlier today the newest episode of The Star Wars Show dropped on the official Star Wars YouTube, and Ashley made an appearance to discuss the upcoming novel with one of the hosts, Andi Gutierrez. 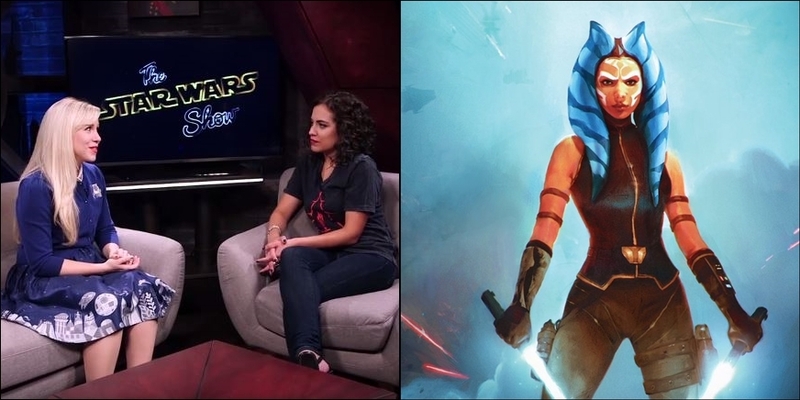 In the interview Ashley revealed some surprising details about Ahsoka. "It was an interesting experience because most of the book is in Ahsoka's voice, or kind of in her head. But there's a lot of other characters in it as well. And I read the whole book. So I'm going to apologize right now, because I think it's the first and last I will ever be asked to voice Bail Organa." "The book tells the story of right after Ahsoka left The Clone Wars. So it takes place between The Clone Wars and Rebels, but specifically right after Order sixty six and before she becomes Fulcrum. And There's so many little nuggets in there... It also tells how Ahsoka got her Lightsabers." Ashley, along with Ahsoka author E.K. Johnston, will be particpating in a book tour that begins this weekend at New York Comic Con and visits several cities across the United States through November. You find out more about the tour by clicking here! Star Wars: Ahsoka will be available wherever books are sold starting next Tuesday, October 11th! Looking forward to this but the only thing I hate about audio books is hearing men do women's voices and vice versa. They sound like trannys. Not that theirs anything wrong with that.